† Kanato Miyabi will not appear in Act One, Scene 16, and Act Two, Scenes 1B, 16B, and 17 from 2016/07/22 - 2016/08/22, due to injury. For the Grand Theater shinjin kouen, Yumekaze Sayaka will fill in for Kanato's Black Angel role while Yukino Kasari will take up Yumekaze's Court Lady role. At the end of the nineteenth century, Empress Elisabeth of Austro-Hungary, reputed to be the prettiest woman in Europe, was murdered by Luigi Lucheni, an Italian anarchist. Lucheni later hanged himself in his cell. The Purgatorial Court interrogates Lucheni although he committed the offence a hundred years ago. He justifies himself by insisting that Elisabeth and Death loved each other and that Elisabeth then wanted herself murdered. He conjures up his contemporaries as defense witnesses. Der Tod (Death) appears last in court and confesses that he loved her. Back in 1853, Elisabeth, Princess of Bavaria, cheerfully enjoys her girlhood. One day, she tries to walk a tightrope. She falls off the rope and into a critical condition without gaining consciousness. She strays into Hades, where Der Tod falls in love with her at first glance. He gives her life back to her and determines to follow her in order to win her love. Thus, the first step is made in the circle dance of love and death. At the Palace in Vienna, Franz Joseph, the young Emperor of Austria, is dealing with problems in his vast empire, advised by his mother, Queen Dowager Sophie. Sophie is planning to take him to Bad Ischl where he will meet his cousin Helene, the woman Sophie wants him to marry. However, at Bad Ischl, Franz Joseph falls instead for Elisabeth, Helene's younger sister who is accompanying Helene. In 1854, the wedding of Franz Joseph and Elisabeth takes place in Vienna. At the wedding ball, the wedding guests are amazed at the childishness of the new empress and vent their disappointment. Count Max, Elisabeth's father, and Sophie forebode catastrophe for the marriage. Elisabeth and Franz Joseph happily waltz in ignorance of what the others think of them. Der Tod stares at them with jealousy and finally whispers in her ear that she will dance the last dance with him. The marriage soon runs into difficulties. Sophie imposes lengthy court etiquette lessons on Elisabeth. She requires Elisabeth to respect the rigors of the Hapsburg court and perform the weighty duties of the Empress. Elisabeth runs to Franz Joseph for protection, but he casts her aside. Elisabeth is so dismayed that she picks up a knife to kill herself. However, after giving it a second thought, she rejects the seduction of Tod (Death), and is determined to live on by herself. Two years after the wedding, the first child is born. However, Sophie keeps the child out of Elisabeth's reach. Elisabeth's hatred for Sophie grows even stronger. Soon, Elisabeth realizes that her beauty will win her anything she wants. In Hungary, the movement for independence has been growing stronger. However, when the Hungarian people see Elisabeth making efforts to understand Hungary, they start praising her instead of crying for independence. Der Tod tempts Elemer Batthyany and other Hungarian revolutionists to go to Vienna, where they will gather more revolutionists and secretly work out plans to bring down Austrian rule. Austria on the verge of bankruptcy because of the successive wars is suffering from the rampant plague and is afraid of rebellions. Franz Joseph is exhausted. When he asks her for help, she urges him to choose between her and his mother. Again, Der Tod tries to seduce her but she turns him away once more, deciding that she will survive with her beauty as her weapon. She starts spending lavishly for her beauty care. In the streets, the poor complain of the shortage of milk and amass hatred against Elisabeth who is said to use milk everyday for her milk baths. Der Tod entices Lucheni to stir up the anger of the people. Elmer and his comrades take advantage of the people's hostility to prepare for the revolution against the House of Hapsburg. Franz Joseph for once decides to accept all of Elisabeth's wishes. Now that Elisabeth has won the long conflict with Sophie, she declares that she belongs to her under the eyes of Der Tod. In 1867, as the coronation ceremony ends, Elisabeth becomes Queen Consort of Hungary. She is too busy to care for the young Archduke Rudolf. Der Tod approaches and comforts Rudolf who is spending desolate days. As time passes, Rudolf finds more solace in the arms of Der Tod. When he is grown up, he goes in with Elmer's group of revolutionists and works for the independence movement. Franz Joseph discovers his son's plot to overthrow him and threatens to disown him. Rudolf begs Elisabeth to ask his father to forgive him, but she refuses. Rudolf is driven to despair and runs to Der Tod, who finally takes his life. Before Rudolf's coffin, Elisabeth breaks down. For the first time, she asks Der Tod for help but he refuses. What Der Tod wants is not her life but her love. Elisabeth continues traveling far and wide. Franz Joseph comes to visit her at Lake Leman where he begs her to return to Vienna. However, this visit cannot bring the couple any closer together. In 1898, on a pier in Geneva, Lucheni attacks Elisabeth with the knife Der Tod has handed him. Elisabeth notices the presence of Der Tod and decides to accept his love, turning face-to-face toward Lucheni. The knife pierces her left breast. Tod, who finally won Elisabeth's heart, passionately embrace her, and together they soar up to the heavens. Final performance for Tenrei Mion. Kanato Miyabi was absent from the Tokyo, including the shinjin kouen, due to injury. Her shinjin kouen role of Black Angel was performed by Yumekaze Sayaka, and Yumekaze Sayaka's palace lady was played by Yukino Kasari. 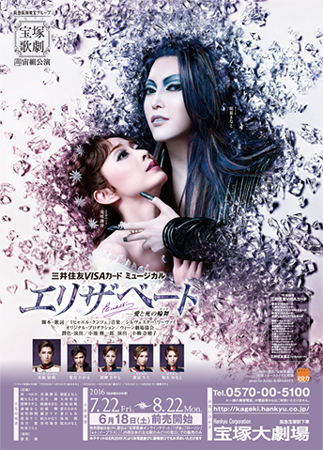 Note from the official webpage: This musical was born in Vienna, however in 1996 Takarazuka staged its debut production, the leading role being the Lord of Hades (death) and featuring original staging, costumes and choreography. The creative script and beautiful melody have captivated audiences, and up until now has been performed 899 times, and seen by 2,160,000 people, making it one of the most popular shows to represent the Takarazuka Revue. 2016 marks the 20th anniversary of its Japanese debut, and with Asaka Manato at the center of Cosmos Troupe this production marks a new page in history. Created by daimon_sakura. Last Modification: Monday 25 of February, 2019 06:35:35 PST by caithion.